Team news as Catalans Dragons host Castleford Tigers in Monday's Super League fixture at Mobile Rocket Stadium (17:00 BST). Super League clubs set a new attendance record for a single round of games, with 79,173 fans across six matches. Castleford hold on to seal a seventh Super League win of the season despite a thrilling Wakefield comeback. David Fifita sits top of the Steve Prescott Man of Steel leaderboard, after a thrilling Super League round 10 display. Despite Wigan Warriors' dramatic loss to Castleford, George Williams scores a "sensational" try from a run which started deep within the Tigers' own territory. Who will make Old Trafford Grand Final? Read more on Who will make Old Trafford Grand Final? BBC Sport's rugby league correspondent Dave Woods gives us six reasons to be excited about the 2019 Super League season. Super League returns for 2018 on Thursday - BBC rugby league correspondent Dave Woods picks out six things to watch. Why no hullaballoo for Castleford's win? Castleford's league win is a fairytale accomplishment, writes Dave Woods, so why aren't we shouting about it? Read more on Why no hullaballoo for Castleford's win? BBC Sport looks at some of the stories and teams to watch during the 2017 Super League campaign. A fascination with the NRL's ruthless approach has starved English fans of entertainment - it's time to focus on fun again, says Dave Woods. Grand Final winners St Helens start the 2015 season against Catalan Dragons, with Widnes facing Wigan in their first game. 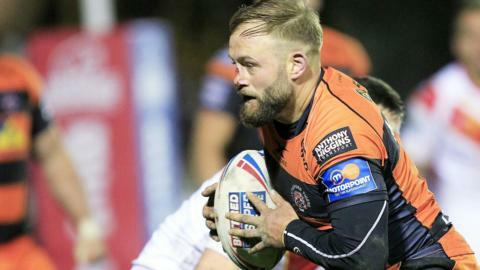 Castleford half-back Brett Seymour on his battle with depression and the night "everything came to a halt"
Restructuring Super League: Will it work? Read more on Restructuring Super League: Will it work? This week's sport on the BBC.